Changes from 2008: California companies had 57 fewer directors overall compared to last year: 9 fewer at the top tier, and 48 fewer at the second tier. 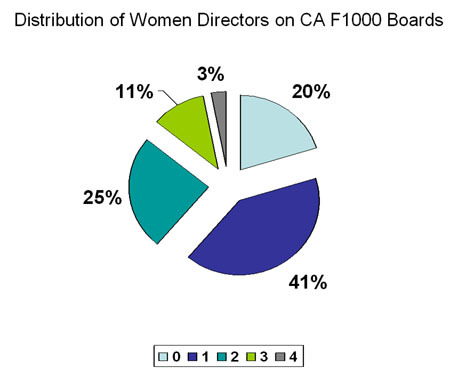 California had 12 fewer women directors than last year (7 fewer at the top tier and 5 fewer at the second tier.) That happens because of a mixture of trends. In any given year, companies depart the Fortune 1000 list due to relocations, mergers/acquisitions, or because of revenue losses. There were 5 fewer California companies compared to last year: 11 companies left the list while 6 new companies were added. 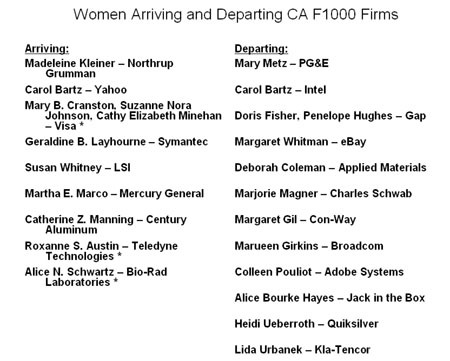 The departing companies had 11 women directors. The arriving firms added 5 new women directors. There was even more turnover of women directors within the corporations, as several retired, some took on corporate leadership roles elsewhere, among a host of other reasons. 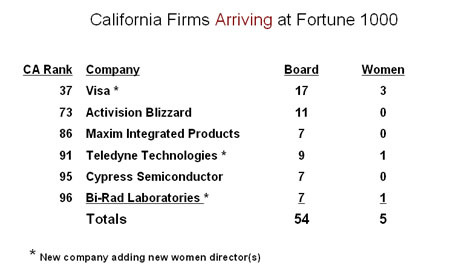 A total of 13 women departed their board positions during the year at companies still on the list. Other companies that remained on the list added 6 new women directors in addition to the 5 new names that arrived with companies new to the list. We can expect continued dynamism in the marketplace throughout the recession. Engines of Growth: Where is net new business growth coming from, within California? In 2008, Northern California companies continued taking the lead in the creation of new businesses as a venture capital center of the state. Last year, Southern California had 44 (42.7%) of the 103 Fortune 1000 companies in the state, compared to 59 (57.3%) in Northern California. Southern California lost 4 of the 11 departing the list, but only added 2 new companies. 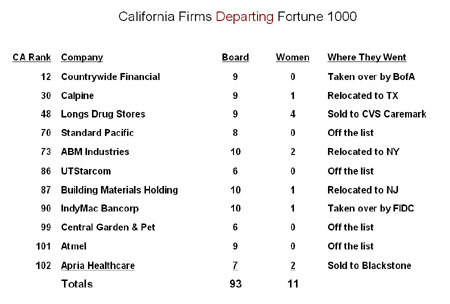 This year, in 2009, Southern California firms were 40 (40.8%) out of the total of 98 Fortune 1000 firms in the state. For the state as a whole, and for Southern California in particular, the loss of top quality firms with their diverse corporate boards, is an issue that cannot be ignored. When companies like Calpine, ABM Industries, Building Materials Holding, not to mention Wellpoint, depart California, they take with them tremendous talent as well as economic power to generate profits, taxes, employment, and long term trickle down effects. Perhaps these are trends the state should seriously assess. Women Per Board: Finally, we have not seen a great deal of change in the mix of the number of women per board. As in the past, 41% of boards have one woman director, 25% have 2 women directors, 11% have 3 women directors, and 3% have 4 women directors. Twenty percent have zero women on their boards.